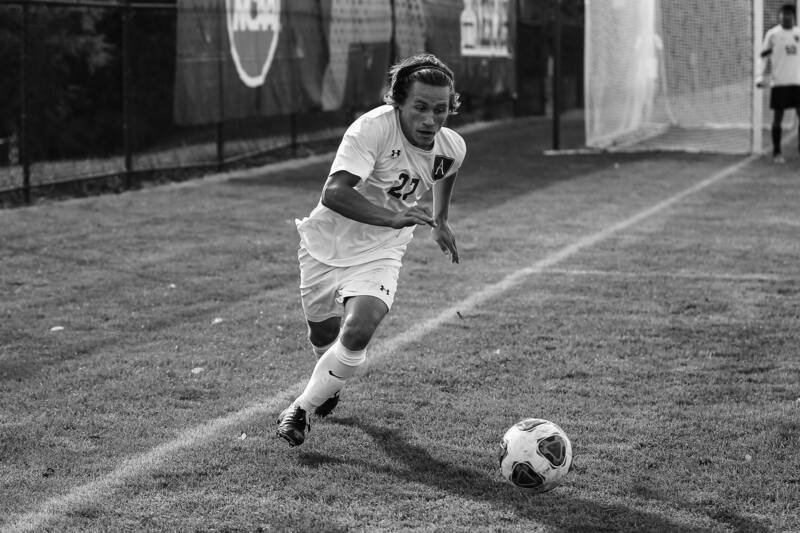 Cutler Coleman ’20 led the team in shots on goal from his wide left position with five against Salem State University in the NCAA DIII Tournament. After a disappointing loss in the NESCAC quarterfinals, the Amherst men’s soccer team has seized upon the opportunity to redeem itself in the NCAA tournament. With wins over both Salem State University and Springfield College this weekend, the Mammoths advanced to the Sweet Sixteen for the eighth consecutive season. On Saturday, a late goal from Fikayo Ajayi ’19 allowed Amherst to secure a 2-1 victory over Salem State. The Mammoths dominated the match from the first whistle, outshooting the Vikings 23-8 and earning a total of 12 corner kicks to Salem State’s one. However, Amherst struggled to capitalize in the run of play. The Mammoths were able to get on the board in the 23rd minute when Ajayi buried a penalty kick, but that was the hosts’ only goal of the half. Only eight minutes into the second half, Salem State’s Alex Carvajal picked up a red card, forcing the Vikings to play out the game a man down. Salem State had been outplayed for the majority of the game up to that point, and Carvajal’s ejection seemed like it would be the final nail in the coffin for the Vikings. However, the Vikings’ Grace Dos Santos made things interesting when he snuck a shot past Amherst keeper Michael Stone ’21 to tie the game with just over a quarter of the game to go. In the final 20 minutes of the match, both teams looked dangerous. Jimmy McMillian ’20 first rang a shot off the post in the 73rd minute. Ten minutes later, the Vikings created perhaps their best chance of the game, when Salem State’s leading scorer Mayele Malango found himself one on one with Stone. However, Stone expertly closed down Malango’s angle to make the save. Just a few minutes after Malango’s chance, Ajayi notched his fifth goal of the season by swinging a corner kick into the back of the Vikings’ net to seal Amherst’s progress to the next round. Sunday proved to be another close call, as the Mammoths bested Springfield College in a penalty-kick shootout. Once again, Amherst got on the board first when sophomore midfielder Luke Nguyen recorded his first goal of the season in the 28th minute. Receiving a ball 30 yards out, Nguyen launched a rocket into the back of the net. The Pride were unable to tie the game until the 73rd minute, when they scored a goal off of a corner kick. Cam Powell headed the ball on frame, and though Stone made the initial save, Jimmy Wilcox tapped in the rebound to knot the game at one goal apiece. After two scoreless periods of overtime, in which both teams came close to scoring the “golden goal,” the game went to penalty kicks. Having proven himself to be excellent in close-range situations, senior goalie Lee Owen came in for Stone in the shootout and managed to save one of Springfield’s four attempts on goal. Springfield’s other three takers failed to put their shots on frame, leaving Amherst only needing two goals to win. Thanks to composed finishes by Weller Hlinomaz ’18 and Felix Wu ’21, the Mammoths easily won the shootout 2-0 and secured a spot in the third round of the tournament against the University of Rochester this Saturday.